It’s officially awards season folks, as Sunday evening marked the 71st Annual Golden Globe Awards! The best of the best from the movie and television industries flocked the renowned Beverly Hilton Hotel last night, eagerly anticipating the show, hosted by hilarious gals Tina Fey and Amy Poehler, and all of the glitzy trophies to be won! A huge congrats goes out to all the lucky winners, by the way. 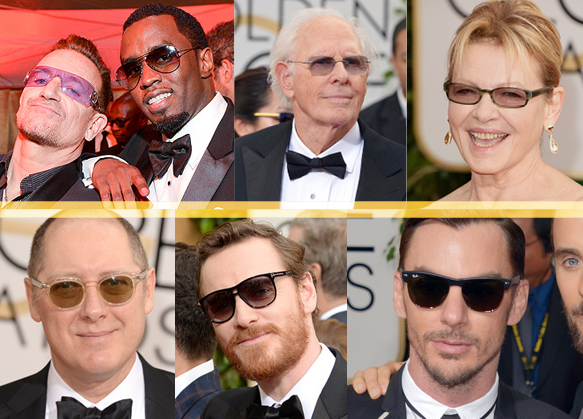 As always, the stars wowed us with their gorgeous red carpet garb, not to mention their fabulous eyewear and sunwear pairings! Check out the oh-so-cool specs and sunnies that adorned the faces of some of our fave celebs below. Ladies and gents alike went wild over chunkier glasses primarily in jet black and chocolate brown hues, and in an array of silhouettes—dapper round, sleek rectangular, chic cat-eye and geeky square profiles ran the gamut! We even spotted some sophisticated rimless frames in the mix. Although not as popular, shades also made a few special appearances throughout the event. Tinted lenses—in purple, amber and gray—proved to be A-list must-haves, as well shield, aviator, wayfarer-inspired, rectangular and rounded square shapes!